Playing cards, reading books, and engaging in other mentally stimulating activities can help ward off dementia later in life, new research suggests. Scientists tracked more than 15,500 people ages 65 and over in Hong Kong for five years and routinely asked them about the “intellectual activities” they’d engaged in, including reading books and newspapers, playing board games, and even betting on horses. None of the participants had dementia at the start of the study, but by the end more than 1,300 participants had the condition, says Time​.com. Does brain fog affect you more and more lately? Do you walk into a room and can’t remember why you went there? Have you totally forgotten an important date or event? Do you start sentences and not know quite how to end them? Have you come out of a store and can’t remember where you parked – maybe even to the point of thinking your car was stolen? Age-related memory loss can be embarrassing and inconvenient. We recently reported that researchers have determined that our mental cognition begins to decline at 45 years old. That is a sobering thought for most of us – but there is something we can do naturally – to slow down this process. Our brains need good nutrients, just like the rest of our body. In fact, it could be argued that good nutrition for the brain is vital to our quality of life as we age. 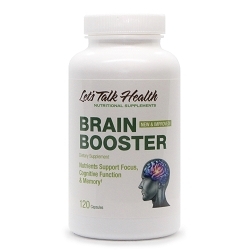 Let’s Talk Health has created the Brain Booster formula to enhance brain function from simple memory loss to serious Alzheimer’s disease.